The Red One camera has four 3-pin mini XLR lin/mic inputs recorded at 24-bit 48kHz. 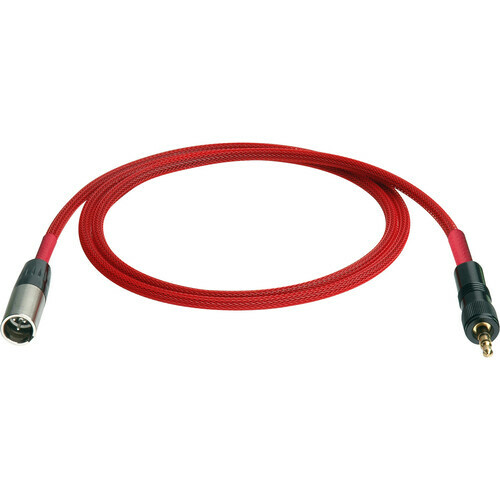 The XLR Male to Mini Plug Stereo Analog for Red One Camera Audio Cable - 3 Foot from Laird Telemedia makes it possible to send analog audio to the Red One from a 3.5mm mini stereo audio source. This premium cable is hand crafted using Belden 1804A Low Impedance Quad Star cable. Connectors are Switchcraft and Neutrik and the cable is wrapped in Techflex tubing for added protection. This cable is compatible with Rev. B cameras only. Box Dimensions (LxWxH) 5.9 x 3.9 x 1.5"